Just a bookworm with her head in the stars and a TBR pile taller than she is. I really want to read this book, but I can't. This is the second time I have tried so hard to pick the book up but instead, have left it 50 or so pages in and not returned to it. 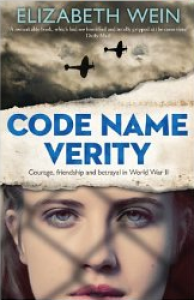 I love the premise of the book, a story told from the point of view of a British spy captured by German forces in WWII, who recounts her events through a series of letters among other things. To be completely honest with you I'm not entirely sure what my issue is with this book. I want so badly to read it and continue on with the duology(? ), but each time I go to read it I end up in a reading slump and never venture past the 100-page mark. The parts that I did read however I thoroughly enjoyed. I would recommend it to anyone that is interested in historical fiction with a little bit of feminism, on the path to equal rights in a time where women were seen as incapable of doing things such as flying planes in order to defend their country. I hope to one day pick this book up again and be able to finish it and receive the full enjoyment I know I could get from this book.